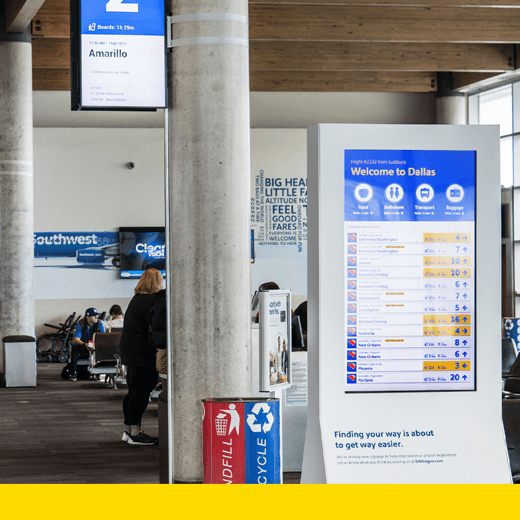 Southwest Airlines has developed a fully digital wayfinding and signage system designed to make traveling easier. Based on customer and employee feedback, all existing airport signage at key locations throughout the airport was redesigned. Each sign in the new system is fully digital and location aware to tailor the experience to the time of day, flight status and customer needs. While Southwest is known for delivering best-in-class hospitality on its airplanes, it sought to improve the in-airport customer experience. By talking with customers, frontline employees and Southwest’s operations teams, the designers identified three challenges: a lack of clear and accurate information, excessive gate crowding and the need for more meaningful customer service. This work was beneficial not only for customers but also for employees. General confusion regarding active flights at each gate area has decreased appreciably with the new system.